Based on the cult 1931 movie featuring one of the horror world’s most famous creations, Frankenstein is a 5 reel, 20 payline video slot powered by Net Entertainment. Goodies on offer in this ghoulish game include linked wilds which can spread and turn multiple symbols wild as well as multiplier that can top your wins by up to 5x and a free spins feature. Head to the lab from between 20p and £100 per spin. Set in a dark and dingy laboratory, the reels include a selection of lower value playing card values as well as the Brain, Fritz, Dr Frankenstein and the Monster symbols. The famous green beast is the symbol to hope for as landing 5 of them in a payline will get you a tidy score of some 1,500 coins. The lightning is the wild – it appears on the middle 3 reels in the base game and replaces all other symbols with the exception of the scatter. The lightning boasts some magical properties too in that it can spread and in the process turn 2 further symbols wild. Land 3 or more of the windmill scatter anywhere on the reels to trigger the Burning Mill Free Spins feature and with it 10 free spins. Look out for the multiplier that can land on reel 5 during the feature and boost your payouts by up to 5x. Your winning chances are further boosted during the feature by the presence of fire wilds – at least 1 of these is guaranteed to land on reel 2, 3 or 4 on each of your free spins. They can also spread and turn 2 further symbols wilds. Finally, land 2 windmill scatters in the feature and you’ll be awarded an extra 5 free spins. Land 3 of them and a further 10 free spins will be added to your tally – these extra free spins are not subject to any multiplier though. 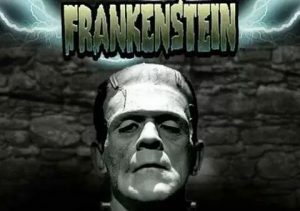 This version of Mary Shelley’s classic monster tale is a relative veteran as far as online video slots go – it first hit online casino shelves in 2011 but has stood the test of time rather well. The retro style graphics hark back to the original 1930s film and have aged rather well. Likewise, the features which have kept Frankenstein very playable. We’d put the variance here in the medium range with wins of over 960 times your stake on each spin. Film buffs and horror fans should get plenty out of this classic chiller – if you get lucky with the spreading wilds and multipliers in the free spins game, the famous monster can help you create a beastly amount of coins too. If you like movie themed games, NetEnt’s Dracula and Microgaming’s Jurassic Park and well worth a look.